This combo board is built with our 3" wide wood frame in our Barnboard finish. Handcrafted with a premium magnetic chalkboard surface with chalk tray on the right and our Natural Cork on the left - see 2nd image in item slide show to view frame and 3rd image to show product details. We build all our combo boards with the highest quality chalkboard material available...with proper care - it is guaranteed to last forever! 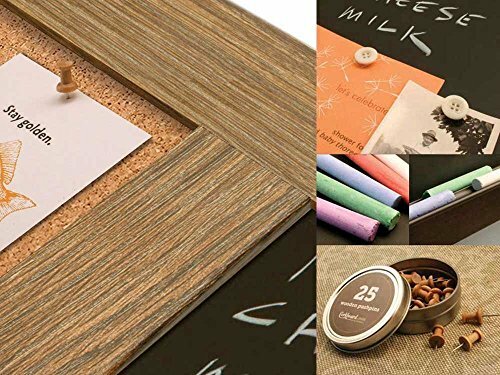 (Beware of low quality chalkboard surfaces, they will wear out) Our chalk combo boards allow you to write notes, lists or leave a message to a family member as well as post photos, cards, recipes or inspirational images with the included wooden pushpins or button magnets. Every board is built from scratch - one at a time - right here in our New England workshop - just for you. We offer three standard sizes: • 48" x 34" • 42" x 32" • 36" x 30" See 4th image in item slide show to compare frame sizes. We also include a few 'extras' with every combo board, including a set of premium chalk, a custom designed matte black chalk tray, a classic wooden eraser and our very own button magnets so you can stick photos, cards and notes to the chalkboard surface. Our 'extras' are shown in the 3rd image above. Plus, every board we build gets our awesome and easy to use hanging system attached to the back. Once you place your order, we will start building your board...our typical turnaround is about 10 business days - let me know if you have any questions and thanks for visiting our shop.